The Church of Antioch is one of the five patriarchates (i.e., the Pentarchy) that constituted the one, holy, catholic, and apostolic Church before the schism between Rome and Antioch in 1098 and between Rome and the other patriarchates at around the same general period. Today it is one of the autocephalous Orthodox churches. In English translations of official documents, the Church of Antioch refers to itself as the Greek Orthodox Patriarchate of Antioch and All the East. The literal translation into English of the Arabic name is "Roman" (in Arabic, Rüm) Orthodox Patriarchate of Antioch and All the East." However, the literal name "Rüm" does not actually mean Roman but Greek. The Arabs and the Turks refer to the Christians who belong to the Greek Orthodox Church (both Arabs and Greeks) as Rüm because the Byzantine Greek-speaking Orthodox have historically referred to themselves as Romioi.The Arabic word "Rum" derives from the Greek word "Romioi". This is one of the reasons why the Church of Antioch refers to itself as Greek Orthodox Patriarchate of Antioch and All the East. The other reason is because it belongs to the family of the Greek Orthodox Churches which are: the Church of Constantinople (patriarchate), the Church of Antioch (patriarchate), the Church of Jerusalem (patriarchate), the Church of Alexandria (patriarchate), the Church of Cyprus, the Church of Sinai, the Church of Greece, and the Church of Albania. The seat of the patriarchate was formerly Antioch (Antakya), in what is now Turkey. Now it is in Damascus, Syria, located on the "street called Straight." The current Patriarch of Antioch is His Beatitude, [John X (Yazigi), who was elected on December 17, 2012. 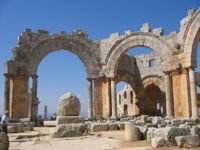 The early history of the Church of Antioch is detailed in the Acts of the Apostles, where in Acts 11:26 the Apostle Luke records that it was in that city that the disciples of Christ were first called Christians. Due to the importance of Antioch as a major center in the ancient Roman Empire, many of the missionary efforts of the apostles were launched from that city. In the early centuries of the Church's history, it was natural that the Church sojourning in Antioch would come to be traditionally regarded as one of the centers of world Christianity. The territory that came to be associated with the bishop of Antioch was that of the Roman Diocese of the East (a diocese was originally an imperial governmental division before it became an ecclesiastical one). During the pre-Nicene period and that of the Ecumenical Councils, Christian theology centered in Antioch tended to emphasize the literal, historical facts of the life of Jesus Christ over philosophical or allegorical interpretations of Holy Scripture, contrasted with the more mystical and figurative theology coming from Alexandria. Antiochian theology, though stressing the "earthier" side of interpretation, nevertheless did not neglect the importance of insight into the deeper, spiritual meaning of the Scriptures. These two viewpoints came to be known respectively as the Antiochian school and the Alexandrian school, represented by major catechetical institutions at both places. Major figures associated with the origin of the Antiochian school include Lucian of Antioch and Paul of Samosata, but its real formation was found with writers such as Diodore of Tarsus, John Chrysostom, Theodore of Mopsuestia, Nestorius, and Theodoret of Cyrrhus. At times, this difference in emphasis caused conflicts within the Church as the tension between the two approaches came to a head, especially regarding the doctrinal disputes over Arianism and Nestorianism. Saints such as John Chrysostom are somewhat regarded as synthesizers of the Antiochian and Alexandrian approaches to theology, and the Antiochian school of theology, whose more deviant proponents produced Arianism and Nestorianism, also enabled the Orthodox fight against the Alexandrian school's deviances, namely Apollinarianism and Eutychianism. Disputes over the Christology of the Fourth Ecumenical Council at Chalcedon—the Monophysite controversy— in 451 led to a schism within the Church of Antioch, which at that same council was elevated to the status of a patriarchate. 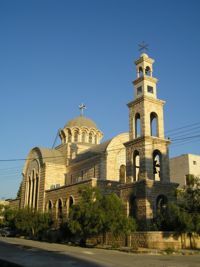 The larger group at the time repudiated the council and became the Syriac Orthodox Church (also called the "Jacobites" for Jacob Baradeus, an early bishop of theirs who did extensive missionary work in the region). They currently constitute part of the Oriental Orthodox communion and maintain a Christology somewhat different in language from that of Chalcedon. The remainder of the Church of Antioch, primarily local Greeks or Hellenized sections of the indigenous population, remained in communion with Rome, Constantinople, Alexandria, and Jerusalem. This is the current Greek Orthodox Patriarchate of Antioch and All the East which is considered by the other bishops of the Orthodox Church to be the sole legitimate heir to the see of Antioch. The schism greatly weakened the Antiochian church, and in 637 when Antioch fell to the Muslim Arabs, the "Greek" church was perceived by the invaders as allied to the Romano-Byzantine enemies of the Arabs. During the subsequent period, Antiochian Orthodox Christians underwent a lengthy period of persecution, and there were multiple periods of either vacancy or non-residence on the Antiochian patriarchal throne during the 7th and 8th centuries. In 969, the Roman Empire regained control of Antioch, and the church there prospered again until 1085, when the Seljuk Turks took the city. During this period of more than a hundred years, the traditional West Syrian liturgy of the church was gradually replaced by that of the tradition of the Great Church, Hagia Sophia in Constantinople. This process was completed sometime in the 12th century. In 1098, Crusaders took the city and set up a Latin Patriarchate of Antioch to adorn its Latin Kingdom of Syria, while a Greek patriarchate continued in exile in Constantinople. After nearly two centuries of Crusader rule, the Egyptian Mamelukes seized Antioch in 1268, and the Orthodox patriarch, Theodosius IV, was able to return to the region. By this point, Antioch itself had been reduced to a smaller town, and so in the 14th century Ignatius II transferred the seat of the patriarchate to Damascus, where it remains to this day, though the patriarch retains the Antiochian title. The Ottoman Turks conquered the city in 1517, under whose control it remained until the breakup of the Ottoman Empire at the end of World War I. During this period, in 1724, the Church of Antioch was again weakened by schism, as a major portion of its faithful came into submission to the Roman Catholic Church. The resultant Uniate body is known as the Melkite Greek Catholic Church, which in the current day maintains close ties with the Orthodox and is currently holding ongoing talks about healing the schism and returning the Melkites to Orthodoxy. 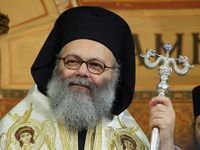 Fearing for the preservation of the Orthodoxy of the Antiochian see, parishioners and bishops requested the ecumenical Patriarchate to send them a Greek patriarch. The Greek presence on the Antiochian see lasted from 1724 to 1898 until Malathius I (Doumani) the Damascene, an Arab patriarch, was appointed. A renewal movement, involving Orthodox youth in particular, has been under way since the 1940s. The St. John of Damascus Patriarchal Institute of Theology (Tripoli, Lebanon) was established by the patriarchate in 1970, and in 1988 it was fully incorporated into the University of Balamand. The Institute functions as the primary seminary for theological schooling for the patriarchate's clergy and lay leaders. The Holy Synod of Antioch includes the patriarch and all the ruling bishops. Meetings are held each year in Spring and Autumn at the patriarchate to consider church-wide issues, and to elect the patriarch and other bishops as needed. The patriarch and holy synod govern the Church of Antioch to preserve the true faith, to maintain ecclesiastical order, and to carry out the commandments of Christ. In addition to the synod itself, a general conciliar body meets twice a year to see to the financial, educational, judicial, and administrative matters of the patriarchate. It is composed of members of the synod and of lay representatives. When a new patriarch is to be elected, this body selects three candidates from whom the holy synod chooses the new patriarch. The most recent patriarch was His Beatitude Patriarch Ignatius IV (Hazim) of Antioch and all the East, elected in 1979. Patriarch Ignatius was particularly active in strengthening ties with other Christian communions, but particularly with those whose roots are in Antioch. His Beatitude and the holy synod of Antioch were enthusiastic for the Church of Antioch to participate in general talks between representatives of all the Eastern Orthodox and Oriental Orthodox Churches. At Anba Bishoy in Egypt and at Chambesy in Switzerland, plenary talks were held resulting in agreements in 1989, 1990 and 1993. All official representatives of the Eastern Orthodox and the Oriental Orthodox there present reached agreement in these dialogues that the Christological differences between the two communions are more a matter of emphasis than of substance. Although elements in a number of the Eastern Orthodox Churches have criticized the apparent consensus reached by the representatives at Anba Bishoy and Chambesy, the patriarch and holy synod of the Antiochian Orthodox Church welcomed the agreements as positive moves towards a sharing in the Love of God, and a rejection of the hatred of insubstantial division. As recommended in the Agreement of 1990, the Antiochian (Eastern) Orthodox Patriarch Ignatius IV formally met with the Syriac (Oriental) Orthodox Patriarch, Ignatius Zakka I, on July 22, 1991. At that formal meeting, the two patriarchs signed a pastoral agreement which called for "complete and mutual respect between the two churches." It also prohibited the passing of faithful from one church to the other, envisaged joint meetings of the two holy synods when appropriate, and provided for future guidelines for intercommunion of the faithful and Eucharistic concelebration by the clergy of the two churches. The Church of Antioch expects these guidelines to be issued when the faithful of both churches are ready, but not before. Patriarch Ignatius also oversaw participation in a bilateral commission with the Melkite Greek Catholic Church, which is exploring ways of healing the 18th century schism between the Melkite Catholics and the Antiochian Orthodox. In an unprecedented event, Melkite Patriarch Maximos V addressed a meeting of the Orthodox holy synod in October 1996. The members of the holy synod of Antioch continue to explore greater communication and more friendly meetings with their Syriac, Melkite, and Maronite brothers and sisters, who all share a common heritage. With the onset of the civil war in Syria in 2010, the situation of Christians in Syria has worsened. Several churches have attacked and destroyed, and many Christians have been expelled by rebels and become refugees. Patriarch Ignatius remained on the Patriarchal throne until his death in 2012. The Holy Synod of the Church of Antioch then elected the former Antiochian Metropolitan for Europe, John Yazigi to the patriarchal throne of Antioch on December 17, 2012, with the title of His Beatitude John X of Antioch and all the East. Extensive 20th and 21st century Arab immigration to the New World has further increased the size, vigor and influence of the Church of Antioch, and the majority of Antiochian faithful now reside outside the Middle East and include numerous non-Arabic converts to the Orthodox Christian faith. As a result, besides its Middle Eastern territories in Syria, Lebanon, Iraq, Kuwait, Iran, the Arabian Peninsular, and parts of Turkey, the Church of Antioch also includes missionary dioceses in Central, North, and South America, in Europe, and in Australia and the Pacific. The archdiocese with the largest population is North America. It is also the only one with internal dioceses. The archdiocese with the largest area is Australia and New Zealand. Estimates of the membership of the patriarchate range from 750,000 to over 1,000,000 in Syria alone. The Antiochian Patriarchate consists of nineteen archdioceses, each ruled by a Metropolitan Archbishop. Of these, only the Archdiocese of North America has constituent dioceses. Only those dioceses with OrthodoxWiki articles are listed. This page was last edited on February 23, 2015, at 03:04. This page has been accessed 301,883 times.